The Datatron EXT Environmental Monitoring System can protect your valuable products. Whether it be priceless research, cryo-stored embryos, pharmaceuticals, or refrigerated transport you can rest easy with the peace of mind knowing that your product is protected 24/7. The Datatron EXT Environmental Monitoring System has been specifically designed to monitor both your local facility and off site facilities, whether they are around the block or around the world. With our Certifyi Monitoring Service, you can use the Datatron EXT Environmental Monitoring System for a low monthly fee using your "operating" budget, thus eliminating the need to purchase the monitoring system using your "capital" budget. The Certifyi Monitoring Service includes initial NIST calibration, validation, free software upgrades, free 24/7 "hotline" telephone support, and is supported for the duration of your contract (no annual service contract). All for one low monthly fee. Our mission statement and promise to you is to provide leading edge monitoring technology at a price you can afford. Reduce your loss and liability costs and citation risk to zero by contacting us today for product information and a free no obligation consultation and quote. 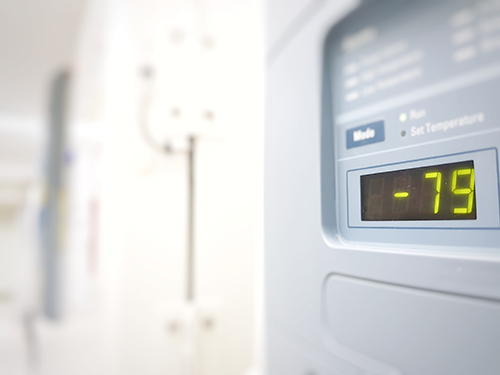 Monitor the temperature of refrigerators, freezers, incubators, storage rooms, test chambers, LN2 tanks, ovens and more. Customizable alarm limits and alert notification options. Web based user interface allows for remote access of the system from other workstations, laptops, home computers, and smart phones. Monitor any other real world condition such as Humidty, Pressure, CO2, O2, Light, Tank Level, & Dry Contacts. Use an independent sensor or take readings directly from your equipment if there is an available output. Feature-rich reporting functionaility including built-in, user configurable reports for data, events, deviations, comparison, configuration history, and automatic period reports. Monitor your refrigerated trucks from point to point with our reusable Trekker USB Data Loggers. The Datatron EXT Environmental Monitoring System is fully Validated to FDA 21-CFR-11 / cGMP guidelines upon installation. Validation includes a full IQ / OQ / PQ documentation package. Alarm Messages can be sent via Automated Voice Call, Text Message, and / or Email. Our certified and trained calibration technicians keep you in compliance with FDA guidelines and ensure that all system channels are reading accurately with our 3-point NIST traceable calibration. All of our Ethernet Nodes and WiFi Temperature Sensors have rechargeable battery backup and store and forward data capability in the event of power or network failures. With our free 24/7 hotline telephone support and remote computer assistance our technichal support team is only a phone call away anytime that you need them.